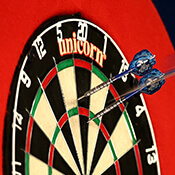 Darts has come a long way since the days of booze, fags and beer bellies in the 1970s. Now, this traditional pub game is one of the ultimate spectator sports and has all the razzmatazz associated with boxing, although the prize money may not be the same! For those of you who love darts betting, BetStars hits the bull’s eye when it comes to tips and odds on the biggest tournaments. Can Freddie make it two out of two with his 33/1 acca? It's that time of the week when Andrew 'Freddie' Flintoff takes on the BetStars Traders to see who can predict the winners of the big sporting events and it is Freddie who has the bragging rights. He enjoyed a clean sweep last weekend with four correct tips in the Premier League and Six Nations as his 24/1 accumulator proved a winner for the first time! Can he repeat that success or will the Traders get revenge? There's only one way to find out! Can Taylor bow out at Ally Pally with 17th world title?